Few children will have had exposure to a wide variety of musical types and genres. (Most of them will have heard mainly “pop” music.) It is essential to teach them in such a way that it broadens their horizons and encourages them to explore new and less familiar types of music, especially those that are more intellectually and artistically challenging. Playing an instrument (or singing) involves time and commitment! It takes time to practise, musical activities take time and they often involve travel, which also takes time! It is also essential to make the commitment – if your child is involved in a choir, orchestra or ensemble, then they must attend regularly and not miss rehearsals – if they do, they will be letting down not only themselves but all the other members of the group. Below you can find information on all the types of instruments that could be played, and advice on when is right to choose the instrument for your child. Young children will not have set musical tastes. Learning an instrument that can play many different kinds of music keeps options open for the future. Does your child like the sound the instrument makes? Bear in mind that many children will never have heard a viola, bassoon, horn or harp played live, at close quarters! Try to give them a chance to hear a wide range of instruments before choosing. Remember that you are choosing for your child not for yourself, so don’t necessarily go for the instrument you always wished you had played, or that you happen to have in the loft, or which you learnt when you were young. Think about how big an instrument is, how loud it is and how expensive it is to buy! Larger instruments are often very much in demand in bands and orchestras, so if you can accommodate them and transport them then they can be a good option. However it is often possible to start on a smaller ‘cousin’ and see how your child gets on before investing in expensive instruments and a larger car. Groups you can sing in: All kinds of choirs and vocal ensembles, church music, oratorio, opera, musicals, folk, jazz, barbershop and countless other contexts. Details: All children should be encouraged to sing, as often as possible, throughout their lives! Practicalities: Free! Try to learn to read music along the way! Groups you can play in: Accompanying, chamber music, various groups and ensembles, jazz, theatre, church etc. Details: Piano is the perfect starter instrument for a youngster. Skills transfer easily to all other keyboard instruments! Practicalities:Learn to read music and try to develop sight-reading skills as much as possible. Electronic pianos are cheaper, take up less space and do not require tuning. Groups you can play in:All kinds of orchestras, ensembles, chamber music, opera, oratorio, musicals, folk, jazz and countless other contexts. Details: Ideal for a musical child. Best to start young! Usual to start on Violin or Cello and transfer to Viola or Double Bass later if you like. Skills are easily transferable. Practicalities: Transport issues for large Cellos and Basses can be a problem, requiring fold-down seats in cars! Groups you can play in: Orchestras, chamber ensembles, various groups and bands, folk, jazz etc.. Details: The recorder is a great place to start when young. Skills transfer easily to the other wind instruments but, later, each instrument requires different skills and techniques so specialisation becomes the key! Practicalities: Reeds are required regularly, and there can be strong competition for places in ensembles on Flute, Clarinet and Saxophone. Groups you can play in: Orchestras, chamber ensembles, various bands,, jazz etc.. Details: Starting with trumpet provides good transferrable skills to the heavier instruments. Horn and Tuba are highly in demand for orchestras and other bands! Groups you can play in: Orchestras, various ensembles, bands, folk, jazz etc.. Details: We strongly recommend that children do not learn only drum kit! Percussion involves a vast range of skills and techniques and good players are in great demand! Must also learn to read music! 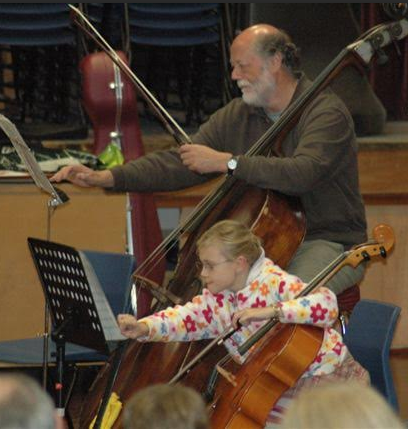 Practicalities: Access to and transport of orchestral and other instruments can be a problem.